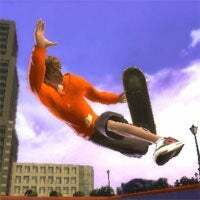 It won't come as any surprise that EA is planning Wii and Nintendo DS "spin off" versions of its skateboarding franchise skate—IGN spilled the beans accidentally in April—but you might be surprised at how good it looks. It might not be on par visually with the Xbox 360 and PS3 entries, but Skate It, at least based on the trio of screen shots IGN secured, looks pretty good. Skate It looks to replace the dual analog control scheme from the original skate with a Wii remote-only method that looks serviceable based on the promo video. As expected, the game also plans to use the soon to be release Wii Fit Balance Board, but executive producer Scott Blackwood is light on details. IGN has the full scoop.